A first-prize winner in the Carmel Chamber Music Society Competition, Dr. Kris Palmer is the director and founder of Black Cedar, a rare ensemble devoted to music for flute, cello, and guitar. Under her leadership, the trio has garnered multiple grants from InterMusic SF and the Zellerbach Family Foundation, commissioned four new works for this unique instrumental combination, released an album of new and re-discovered trios, and earned an invitation to the National Flute Association Convention. “You can easily see why this unique group has become a chamber music draw in the musically rich Bay Area,” writes James Manheim of AllMusic.com. Dr. Palmer created an outreach partnership between Black Cedar and the Arc of Alameda County, bringing free chamber music performances to thousands of adults with developmental disabilities at the Arc’s San Francisco Bay Area campuses. The organization named Dr. Palmer their Bob Perrotti Volunteer of the Year in 2016. Dr. Palmer holds a Doctorate of Musical Arts with an emphasis in eighteenth-century performance practice from Rice University, where she worked as a teaching assistant for seven years. She is the author of the book, Ornamentation According to C.P.E. Bach and J.J. Quantz, and the American Music Teacher magazine writes, “Clearly, the author is knowledgeable about ornamentation.” She earned her Doctorate of Music Arts and Master of Music from Rice University, and her Bachelor of Music from the University of Southern California. Her primary teachers are Carol Wincenc, John Thorne, Aralee Dorough, the late Roger S. Stevens, Walfrid Kujala, Anne Diener Zentner, Leone Buyse, and Gaetano Schiavone with the Conservatory of Santa Cecilia in Rome. Dr. Palmer is a former member of the New Mexico Symphony Orchestra, where she served as acting principal flute on tours; the Chamber Orchestra of Albuquerque, where she held the position of principal flute; and the Debut Orchestra of Los Angeles, where she held the position of second flute. She currently performs as principal flutist with Island City Opera, and she has performed with Houston Symphony, Santa Cruz Symphony, Santa Cruz Ballet, Modesto Symphony, Monterey Symphony, Shreveport Symphony, Ohio Light Opera Company, and Lamplighters Operetta Company. 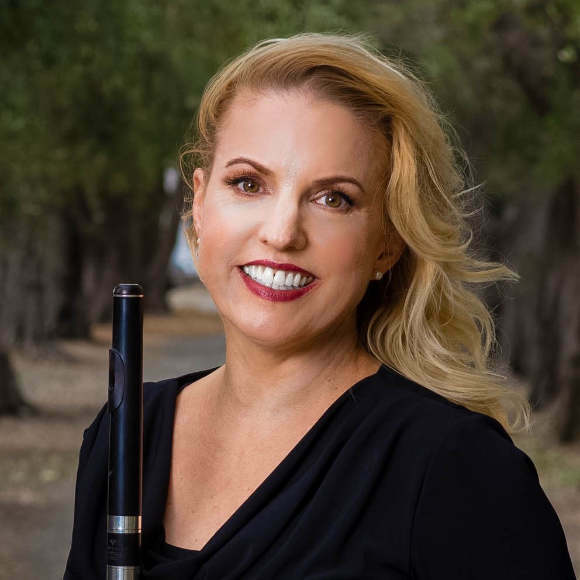 Dr. Palmer began and directed the flute program at the Dominican Sisters School of Music in Fremont, California from 2012 to 2018, where she coached mixed ensemble chamber music as well private flute instruction. Her students have won awards in the U.S. Open Music Competition, Bay Area Music Association Competition, U.S. International Music Competition, Fremont Young Recitalist Competition, and Music Teachers Association of California Certificate of Merit Honors Program. Her students regularly win placements with All-State Honor Groups, the Northern California All-State Honor Band, Santa Clara County All-County Honor Band, and Junior Bach Festival. Dr. Palmer maintains a private flute studio in the East Bay region of San Francisco. Dr. Palmer is a frequent guest lecturer on eighteenth-century performance practice techniques, with engagements at the San Diego Flute Festival, MTAC State Convention, San Francisco International Flute Festival, Skyline College Flute Day, and Areon Summer Flute Institute. This season's lectures and masterclasses include Wichita State University, Chabot College's Early Music Festival, the Mid-Atlantic Flute Convention, and the MTAC State Convention. She has also served as an adjudicator for the U.S. Open Music Competition, MTAC Certificate of Merit Program, Berkeley’s Etude Club Scholarships, Frances Walton Competition, and the Junior Bach Festival.